China, responding to United Nations criticism, academic and media reports, and an embarrassing court case in Kazakhstan, has come closer to admitting that it has brutally cracked down on the strategic north-western province of Xinjiang in what it asserts is a bid to prevent the kind of mayhem that has wracked countries like Syria and Libya. The Chinese Communist Party’s Global Times charged in its Chinese and English editions that the criticism and reports were aimed at stirring trouble and destroying hard-earned stability in Xinjiang, China’s gateway to Central Asia and home to its Turkic Uyghur and ethnic minority Central Asian Muslim communities. The crackdown, involving introduction of the world’s most intrusive surveillance state and the indefinite internment of large numbers of Muslims in re-education camps, is designed to quell potential Uyghur nationalist and religious sentiment and prevent blowback from militants moving to Central Asia’s borders with China after the Islamic State and other jihadist groups lost most of their territorial base in Iraq and Syria. 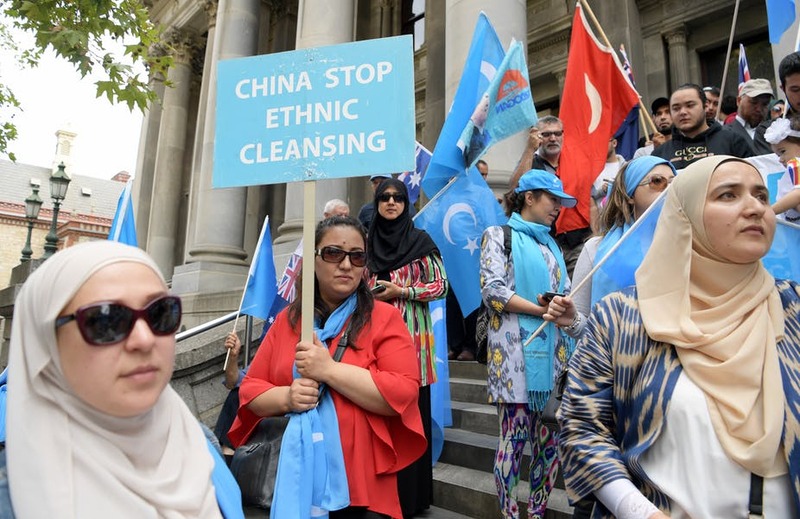 Concern that national and religious sentiment and/or militancy could challenge China’s grip on Xinjiang, home to 15 percent of its proven oil reserves, 22 per cent of its gas reserves, and 115 of the 147 raw materials found in the People’s Republic as well as part of its nuclear arsenal, has prompted Beijing to consider a more interventionist policy in the Middle East and Central and South Asia in contradiction to its principle of non-interference in the affairs of others. The Global Times asserted that the security situation in Xinjiang had been “turned around and terror threats spreading from there to other provinces of China are also being eliminated. Peaceful and stable life has been witnessed again in all of Xinjiang… Xinjiang has been salvaged from the verge of massive turmoil. It has avoided the fate of becoming ‘China’s Syria’ or ‘China’s Libya,’” the paper said. Five Chinese mining engineers were wounded last week in a suicide attack in the troubled Pakistan province of Balochistan, a key node in the US$ 50 billion plus China Pakistan Economic Corridor (CPEC) intended to link the strategic port of Gwadar with Xinjiang and fuel economic development in the Chinese region. The attack was claimed by the Balochistan Liberation Army (BLA) rather than Uyghurs. The UN assertion of the existence of the camps is corroborated by academic research and media reports based on interviews with former camp inmates and relatives of prisoners, testimony to a US Congressional committee, and recent testimony in a Kazakh court by a former employee in one of the camps. Stymying the international criticism and demands for action before they gain further momentum is imperative if China wants to ensure that the Muslim world continues to remain silent about what amounts to a Chinese effort, partly through indoctrination in its re-education camps, to encourage the emergence of what it would call an Islam with Chinese characteristics. China is pushing other faiths to adopt a similar approach. Concern that Uighur militants exiting Syria and Iraq will again target Xinjiang is likely one reason why Chinese officials suggested that despite their adherence to the principle of non-interference in the affairs of others China might join the Syrian army in taking on militants in the northern Syrian province of Idlib. Chinese participation in a campaign in Idlib would be China’s first major engagement in foreign battle in decades. Potentially, there’s a significant economic upside to facilitating regional cooperation in South Asia and military intervention in Syria. Post-conflict, both countries offer enormous reconstruction opportunities. Said Middle East scholar Randa Slim discussing possible Chinese involvement in the clearing of Idlib: “You have to think about this in terms of the larger negotiations over Chinese assistance to reconstruction. Syria doesn’t have the money, Russia doesn’t have the money. China has a stake in the fighting.” It also has the money.